Have you spent countless hours shopping online or looking in your local hardware store for that perfect gold chrome spray paint? Maybe you’re looking for a matte finish? Either way, it’s probably been a tough decision and now you’re stuck. We have just the solution that you are looking for. We have scoured some gold spray paint reviews and now have a bunch of them for you to consider. But first, it’s important that you know what characteristics to look for and how they can help you. Finish: Matte or glossy? This is a question that a lot of people have when they are looking for their spray paint. They both leave very different finishes and if you choose the wrong one, it can ruin the whole look of the piece of furniture. Color: There are tons of different shades of gold out there. If you’re going to a specific look, it’s important that you understand what the color differences are. This is especially true if you run out and get the wrong kind. Multi-Surface: Do you want your spray paint to adhere to both metal and plastic? This is another important question that you have to ask yourself, especially if you have a bunch of small projects with different surfaces, but need the same color. Type: Paints come in various formulas: acrylic, latex, oil-based. The item you are painting will determine what formula will work best for you. For example, if you are painting something that will be outside in the elements, you’ll want an oil-based paint. Check out this information to see what type of paint you are buying. Size: Size does matter sometimes! In this case, if you are working on a large project, you certainly don’t want to have to keep going back and forth to the store for multiple small cans of spray paint. For large projects, buy the large cans. Fast-Drying: Does your project have to be done in a hurry? If so, this is when you would want to use fast-drying spray paint. This is also best if you need to do multiple layers and you want it done quickly. Okay, so now we have come to the part where we give you a detailed gold spray paint buying guide with 10 of the best gold spray paints that are on the market. If you are in a hurry and just want the best there is, check out number one, which is our top pick. If you are looking for something cheap, then go check out number two, which is our budget pick. Are you ready to get started? Alright, let’s go! 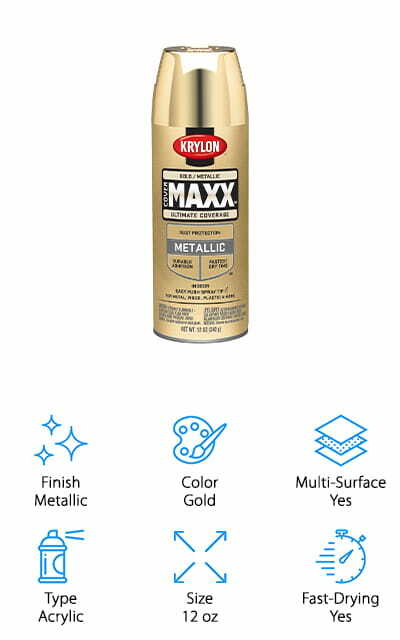 Coming in at the top of the list is the Krylon Gold Decorator Paint. 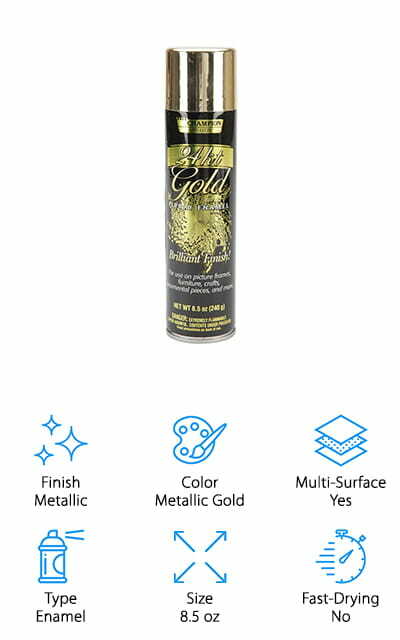 Right now, this is possibly the best gold spray paint for sale for a variety of reasons. This particular spray paint features a handy EZ touch 360 degree spray tip that allows you to reach every crevice that needs to be painted. It can be used on multiple surfaces including glass, wicker, wood, metal, and various paper craft projects. One of the best features of this spray paint is that it dries in 10-minutes or less, which is great for those quick touch-ups before a party. It features permanent protection for both painted and bare surfaces and dries with a non-yellowing finish that’s moisture resistant. There are a ton of colors available and also a Bauhaus gold color. 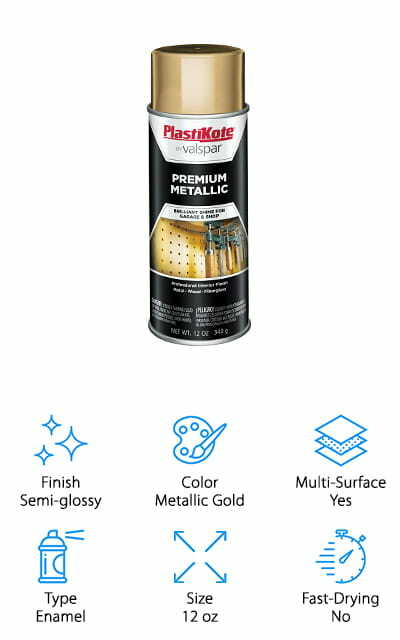 So, if you’re looking for a product that’s both affordable and offers great cover and protection, then you will definitely want to consider the Krylon Gold Decorator Paint. On a budget and need a touch of gold in your life? If so, the Rust-Oleum Metallic Spray Paint is right up your alley. This is a weather and corrosion resistant oil-based paint that protects both exterior and interior surfaces such as concrete, wood, metal, and more. It is fast-drying, which means that in 20-minutes, you will have a completely dry project to enjoy. With one 11 oz can you can cover up to 15 square feet. It offers fantastic resistance to chipping, abrasions, and fading. To ensure maximum coverage, it has any-angle technology. This allows you to spray those difficult to reach areas. You can even turn it upside down. It has a comfortable wide tip for optimal use. 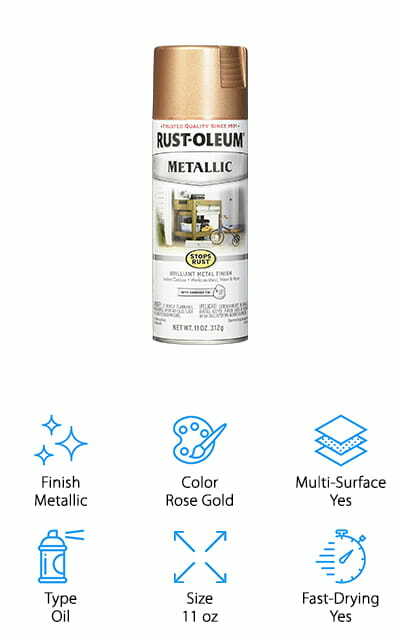 I really like this Rustoleum gold spray paint because if offers you maximum performance, coverage, and it’s affordable. It’s also a great antique gold spray paint as well if that is the style that you are looking for. 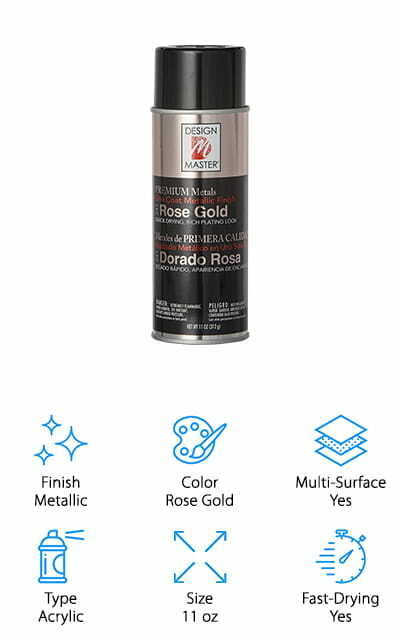 The Design Master Rose Gold Spray Paint is one of the more affordable ones that you can find with the features that it provides. This particular spray paint works on multiple surfaces including pottery, glass, paper mache, wicker, wood and more. This is a fashionable rose gold color that adds a touch of sparkle and shine to your various craft projects and decorations that you have around the home. This is a quick covering spray that dries quickly to give every surface a smooth rose gold plating metallic finish. For the price, you get 11 oz of paint that you can use to cover up to 15 square feet of surfaces. The spray tip makes it easy for you to reach those difficult areas that may not be able to be reached by traditional spray cans. Overall, this is a decent paint for the price that you are going to pay and it leaves a beautiful color and texture behind. 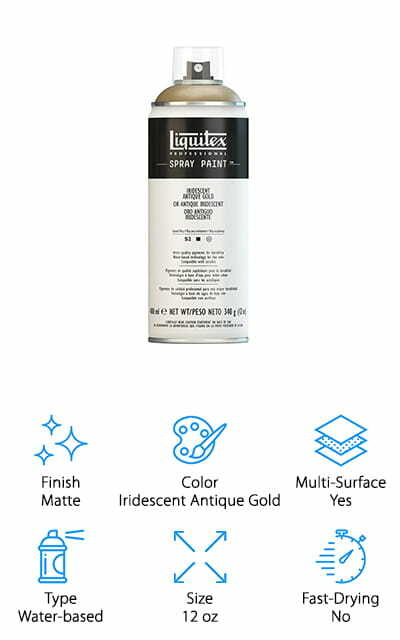 The Liquitex Spray paint is definitely one of the best gold spray paints for plastic surfaces, but it will work on some canvas wood, canvas, glass, and masonry. It uses special water-based technology and has a low-odor. It does not come with the skin or eye irritant warnings that come with other paints, meaning its safe for use. If you make an oopsie, you can clean it with water, but when it is dry, it’s both permanent and weather-proof. It is ideal for both outdoor and indoor use. You can use it for intermixing with acrylics, stenciling, underpainting, large pieces of art, and more. You can layer it with ink, tube color, paint markers, and work wet into wet with mediums. It is rated to lightfastness I or II and is formulated using the same grade pigments that are found in other Liquitex professional ranges. This is an impressive kind of spray paint and there is a full ounce more than most others. 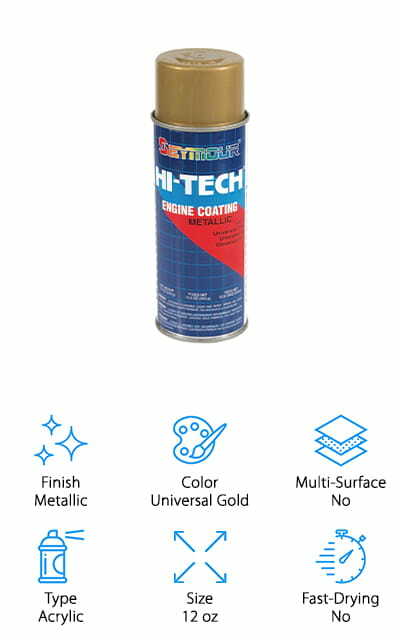 If you’re looking for the best gold spray paint for metal, check out the Seymour Engine Spray Paint. This paint is specifically made for you to use on your engine. Whether it be adding some colors to make it look fancy or cool, or you’re restoring it to its former glory, this will do the job. It is a universal gold color with a metallic finish that may catch the eye of everybody walking past it at your next car show. This paint features a special formulation for close work applications and it provides your engine with a coating that has superior durability under different stress conditions. Not to mention, it’s heat resistant up to 300 degrees F as well as resistant to chemicals and gas. It is VOC compliant and can work on transmissions and other OEM equipment on your vehicle. There are 16 different colors to choose from such as General Motors red, chrome aluminum, Ford gray, Ford blue, and more. 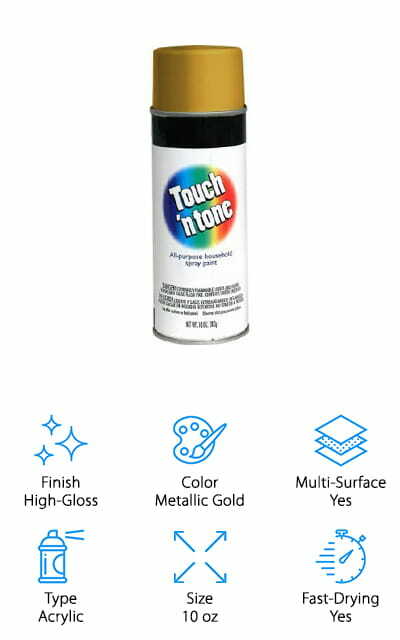 If you’re looking for a product that comes with a great value, check out the Touch N Tone Spray Paint. This high-gloss metallic gold paint is ideal for both interior and exterior use. It is a general purpose spray paint, which means you can use it on almost any surface with perfection. It is fast drying and you can use it to recoat in one hour. Once dry, it has a high-gloss finish that you may certainly be proud of. From this company, you can get 18 different colors, which is a great variety. 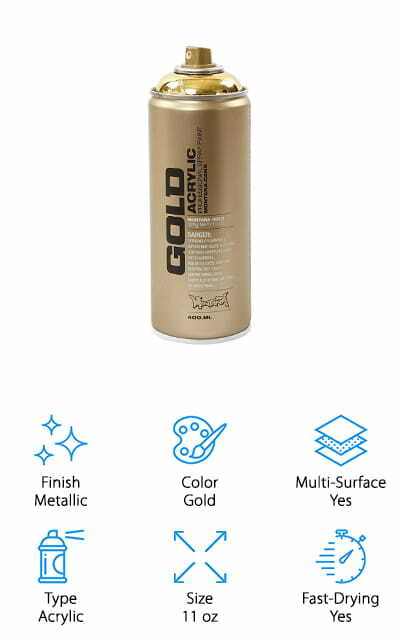 If you are in search of the best gold spray paint, this is a great contender. For the price, you get so much in one can. It can spray up to 15 square feet, depending on how much of it you use in one area. You can use this on all of your indoor and outdoor projects with ease and satisfaction. Do you have a project at home, either indoors or out, that needs to be repainted? Let PlastiKote do the job for you. This is a metallic gold color with a metallic finish when dry. It can be used on metal, wood, plastic, and other surfaces. It is one of the most versatile spray paints that you can get and for a price that isn’t all that bad. Once dry, this paint is tough and resistant to scratches. It is also UV resistant, water resistant, and you won’t have to worry about it fading or yellowing. This particular company offers 20 different colors that you can use on your various projects. This can also be used on engines if you need to repaint yours. It is gasoline resistant and can withstand quite a bit of heat. In this 12 ounce can, you can expect to get 15 square feet of coverage out of it. The Chase Metallic Spray Paint is a beautiful paint. When you spray it on a surface, it gives a 24 karat gold look to it. Its brilliant finish is ideal for use on picture frames, furniture, ornaments, and so much more. You can spray it on almost any surface to get a gorgeous gold metallic look. It allows you to easily restore old frames and crafts into something great looking. The only thing that you shouldn’t spray it on is polystyrene plastic because it turns into a brown color rather than gold. It will work best on non-porous surfaces and it looks amazing like real solid gold. This paint comes in a 8.5 ounce can. The Krylon COVERMAXX spray paint is actually a paint plus a primer, which means you don’t have to buy a separate primer to use before the regular paint. It is ideal for indoor and outdoor use on multiple types of surfaces such as plastic, metal, glass, and more. It has a 10-minute or less drying time, which is ideal for when you need a project done quickly or you need more than one coat and you’re in a hurry. On the top of the can is a conical easy push spray tip that allows you to spray surfaces with more precision and comfort. For the price, you are going to pay for this, it makes for a good value. This is an attractive color and the finish is beautiful. If you’re looking for the best gold spray paint for metal furniture, consider Montana GOLDCHROME spray paint. This is a gorgeous acrylic-based spray paint that works on all kinds of surfaces including wood, plastic, glass, and metal. This fast-drying paint brings you fantastic opaque coverage of pure color and the spray cans are easy to use. They come with a level cap system that allows both high and low pressure performance in one can. All you have to do is switch the cap and you can either have high or low pressure. Artists can go from thin lines and fine details to filling large areas. This paint is 100& lead and CFC free and there is a colored ring on the top of the cap that shows what color is inside. This special formula allows an easy use for working with mixed media. It definitely has some great value to it.